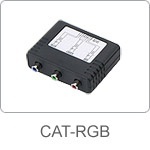 Our RGB Balun uses unshielded twisted pair (UTP) cables to transmit one Red, Green, Blue (RGB) video channel, and when used in pairs the RGB Balun enables transmission of RGB signals with synchronization on Green. For the end user the RGB Balun saves time and cuts costs through the use of twisted pair rather than coax cabling for RGB video equipment. UTP: 24 AWG or lower solid copper twisted pair wires impedance: 100 ohms at 1 MHz.